We have 8 small sided adult male teams, 2 Ladies Teams, 1 Youth & 1 Junior Team. 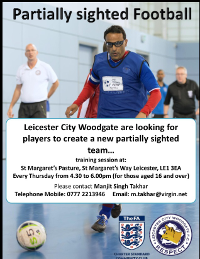 Since 2015-16, we have been identifying and recruiting players who are Partially Sighted to become members of our newly formed – Leicester City Woodgate F.C. 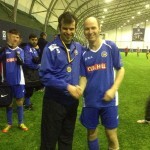 Partially Sighted Team. Overall we have 80 + members of our Inclusive Section. If you, or indeed if you know of someone who would love to become involved as a player or volunteer within our Inclusive Provision, please contact Mary Rudkin below for more details. 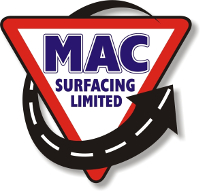 We are also looking for sponsorship for the season 2019-20, so again please contact Helen for details. 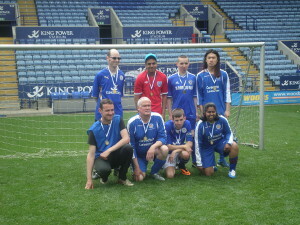 Leicester City Woodgate Inclusive Football Club, hosted a Football Event on the 14th June on behalf of the Special Olympics East Midlands. Sunday 7th June saw just one of our Adult Male teams, our Ladies Team, Junior and Youth Teams taking part in a Festival of Football again hosted by Philippa at St. George’s Park, Burton on Trent, home the the Football Association, a magnificent facility. The Peoples Cup for Leicestershire was hosted at Harborough Town Football Club on Saturday 18th April and organised by Philippa Bass from the Leicestershire & Rutland County FA & Inclusive Football Partnership. Leicester City Woodgate Teams continue with their busy season with Junior, Youth & Adult teams playing their fixtures in the LCFC Dome during March. Leicester City Woodgate Teams always have a good turn out from all our sections competing on a regular basis. 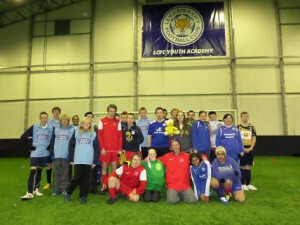 The Junior & Youth Event for the went ahead at the LCFC Indoor Dome on the 31st January. 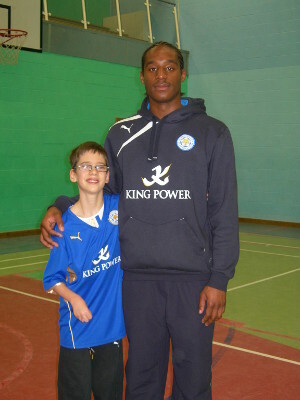 Leicester City Woodgate Junior & Youth Teams attended the event and all players showed respect and had a great time. 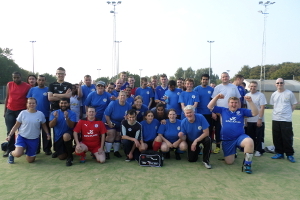 Leicester City Woodgate Inclusive Football Partnership was set up in May 2007 and currently provides regular football opportunities for females, males, youngsters and adults with a special need or learning, physical or sensory impairments or disabilities. 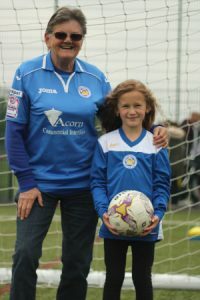 Leicester City Ladies in partnership with Leicester City Woodgate Inclusive Football Partnership runs female only teams for players from the age of 12 years up to adults. We currently have around 7 Youth players U16 and 10 Ladies players, who train and play football on a regular basis. 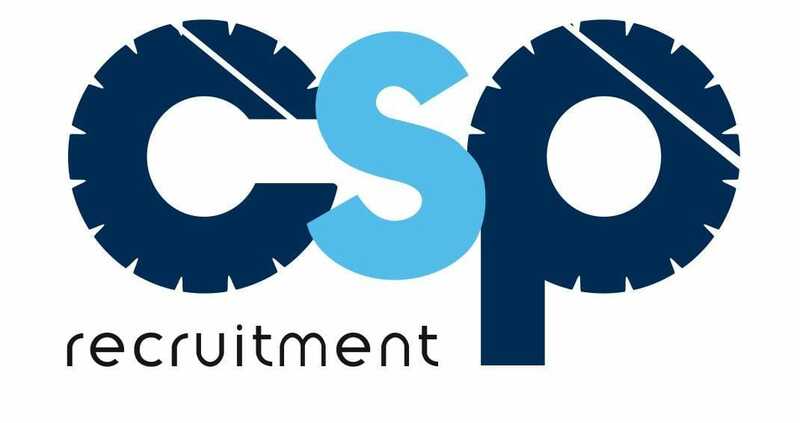 Leicester City Woodgate Inclusive Football Partnership, Junior section, also provides football and fundamental skills training for girls and boys from the age of 6 – 14 years of age. 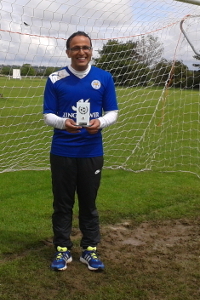 Leicester City Woodgate FC runs adult male teams. We currently have around 30 players training and playing football on a regular basis. St. Margaret Pastures Sports Centre on the astroturf pitches – 4.30 – 6.00 pm.